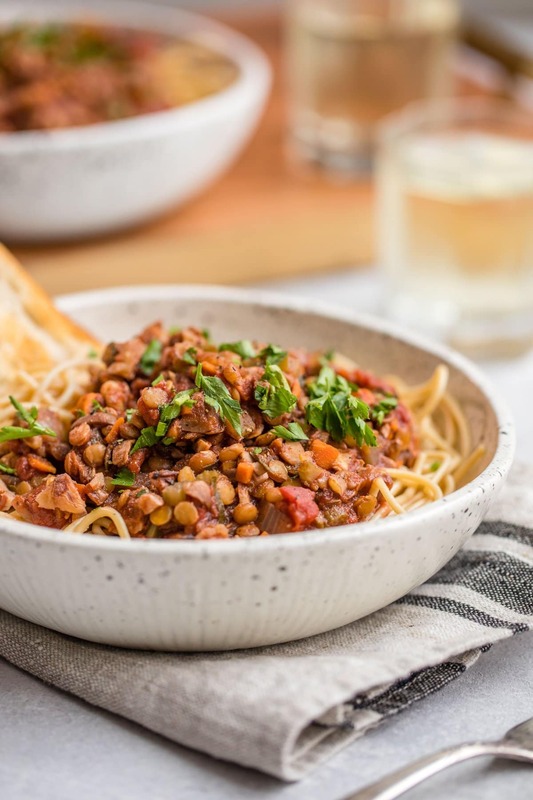 This Lentil Bolognese is hearty, healthy, and made in one pot! This cozy and satisfying Vegan & Gluten-Free Entree is packed with veggies and plant protein. 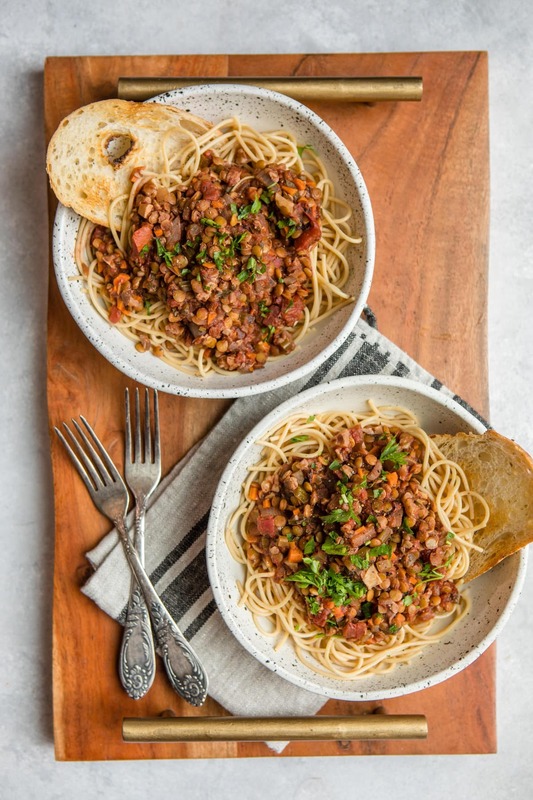 If you’ve never had Lentil Bolognese before, you’re in for a treat. And if you have, you’re still in for a good one – because this version is Vegan, Gluten-Free, Oil-Free, and made with only 12 plant-based and wholesome ingredients! Growing up my family was more of a simple marinara and spaghetti kind of bunch, but boy, do I wish we ate more Bolognese. 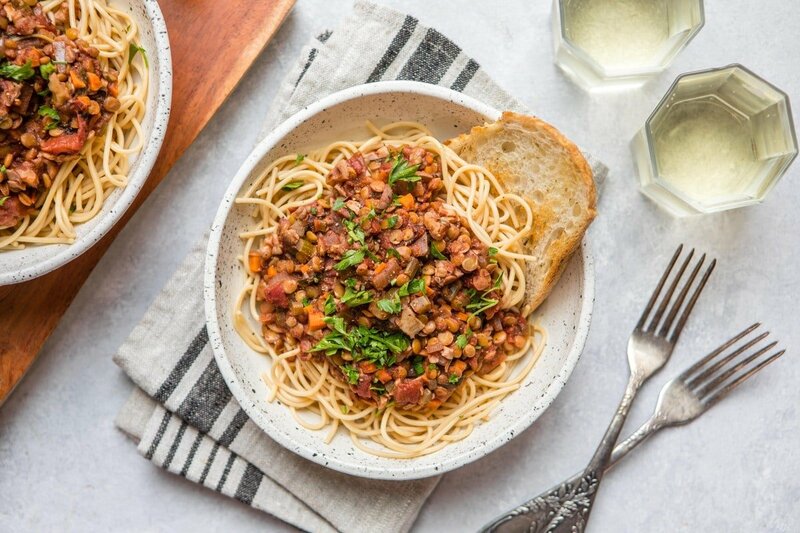 The first time I ever tried this hearty and cozy dish was in college, and I absolutely loved it! Pasta is always great, but combining it with a chunky, tomato-ey, lightly spiced sauce? Now that’s a good meal. 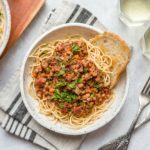 I opted to use a combination of Green Lentils and Walnut pieces for this Lentil Bolognese for a few reasons. The Lentils provide a nice texture (as well as some plant-based protein). The Walnuts provide some healthy fats and a “bite” to the dish that a classic Bolognese would have. I also believe that one can never have too many veggies in their life, and this sauce reflects that. 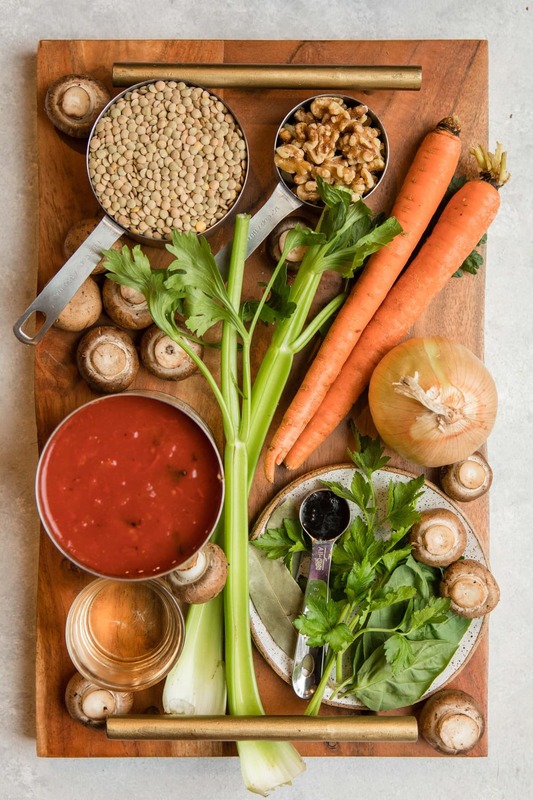 It’s loaded up with Carrot, Celery, Mushrooms, and Crushed Tomatoes, all of which add amazing flavor and nutrition! You’ll also add in a touch of White Wine for extra depth of flavor – this step is optional, but I would highly recommend it. It totally transforms the sauce! This recipe makes a lot of Bolognese sauce, but I think that’s a good thing! You’ll easily be able to feed a large party with it, but you can also freeze your leftovers to enjoy at a later date. 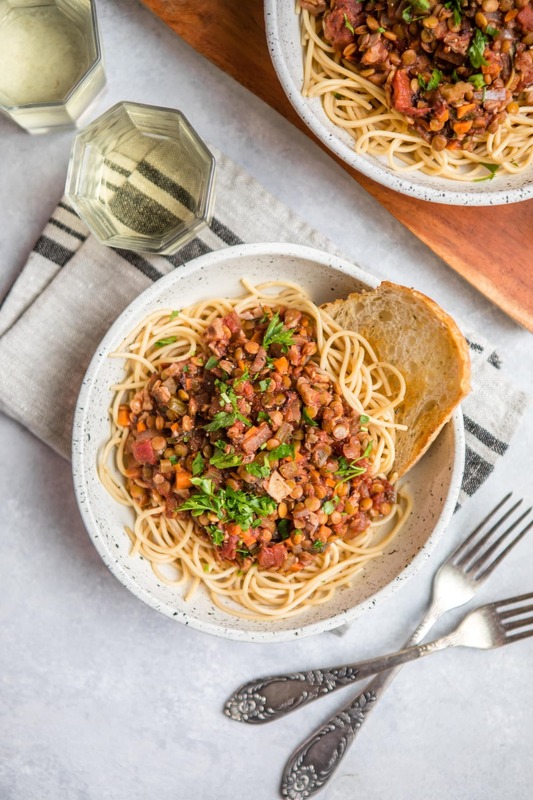 I opted to serve my Lentil Bolognese with this Gluten-Free Spaghetti made from Chickpeas for some extra plant-based protein, but you can use any noodle or shape that you’d like! Make sure to finely chop all of your Vegetables! This is key to getting that classic meat-like texture and consistency. If you’re looking for more cozy Vegan Entrees, you’ll also love this Hearty Mushroom Risotto, this Butternut Squash & White Bean Chili, and this Vegetable Lasagna with White Sauce! Add the Onion, Celery, and Carrot to a large nonstick pot with a splash of water. Sauté over Medium-High heat until translucent, around 4-5 minutes. Once all of the water has evaporated from the pan, deglaze it by adding in the White Wine; sauté for another 5 minutes, to cook off the alcohol. When the pot is dry again, add the Mushrooms, Lentils, Crushed Tomatoes, Vegetable Broth, and Water; stir well and bring to a simmer over high heat. Once simmering, add the Bay Leaves, Parsley, and Basil. Stir into the Bolognese and let the whole mixture simmer for 20 minutes, or until the Lentils are tender. You will need to reduce the heat as you go to prevent splattering, and stir the mixture occasionally to ensure nothing sticks to the bottom of the pan. Stir in the chopped Walnuts, and add Salt and Black Pepper to taste. Serve over cooked pasta, or as desired. Leftovers can be stored in the fridge for up to one week, or frozen for up to one month. You can use any dry White Wine for this recipe – I used a Vegan Pinot Grigio. 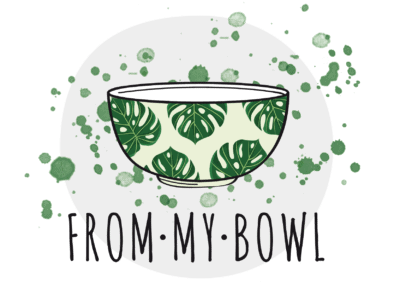 Check out Barnivore for Vegan Wine Recommendations! I would strongly encourage using Wine for this recipe, but if you prefer not to use it simply skip step #2. This Beef-Flavored Bouillon paste is my favorite, but you can substitute with Vegetable Broth in a pinch. Do you need to keep a lid on the lentils when cooking? No, they should cook uncovered! Oh I love this! The recipe looks really good. I already sent it to my wife so we can try to make it for dinner tomorrow night, Thank you! Hey there! You show in both your video and say also here in your instructions to add water, but you don’t ever say how much, as far as I can find. It looks like about 2 cups? Is that right? 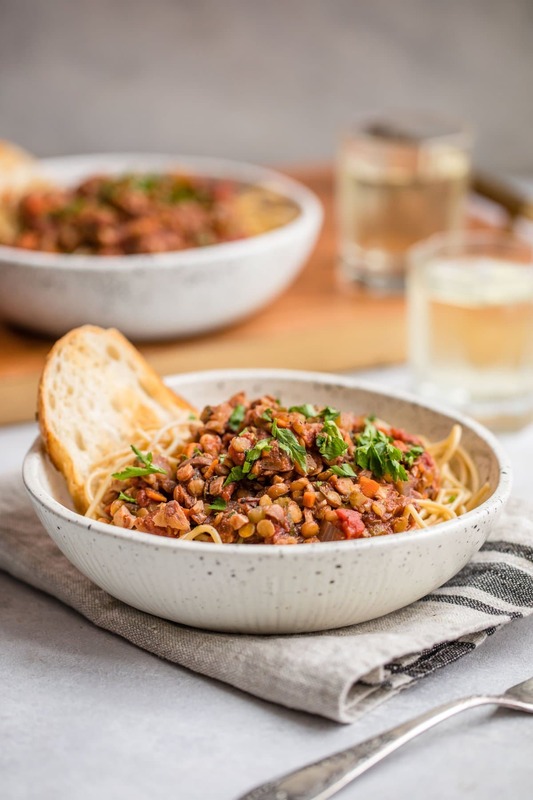 Do you need to wash or soak the lentils before adding them to the sauce? Made this tonight – so yummy!! I added more veggies as well and it turned out great. Thanks for the recipe! I made this for lunch today was it was sooo good! I halved the recipe to limit leftovers, and just added 1/2 teaspoon of Better Than Bouillon paste instead of the 3 cups of broth as listed.. My lentils also took about ~45 minutes to become tender! (did not soak beforehand) but still everything came out great, nice and hearty for a 10 degree day where I live. Thanks for the recipe! Amazing! The addition of the walnuts was inspired! Loved the flavor they added. I made this in the instant pot for 20 minutes using only a cup of broth and no water. Currently in the process of making this and my housemate came downstairs to tell me how good it smells! Thank you for such a yummy recipe! Hi Amber! It should last in the freezer for up to one month 🙂 I would take it out and let it defrost in the fridge for 2 days, or on the counter for a few hours before reheating! Everyone that has tried this has LOVED IT! Thank you for all the recipes! They are never bland, easy to cook and always quite healthy. My boyfriend and I have been absolutely loving everything! Head’s up that lentils really seem to vary in cooking time. The lentils I use in the USA cook very quickly, and lose their individual shape. I just tried to make this for the first time, in Israel, and the lentils were still failry firm after more than 2 hours!!!! Hi, I love your recipes by the way! As Brit, the measurements confuse me as we use grams, millilitres etc. Where you say 2x 28 oz cans of chopped tomatoes does that mean 793grams which is a hell of a lot?